Professional mobile shear sharpening in Northern Colorado and Southern Wyoming. Authorized service center for Shark Fin, Scissor Mall, and others. Call for an appointment 970-988-7942. 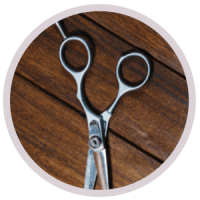 We Have the Right Shears for You. Check out our wide selection of shears and accessories. models without voiding any manufacture's warranties. - Randy Ferman, CEO Shark Fin Professional Shears. Jeff did an amazing job on my shears!! He even fixed my not so great shears and they cut like a dream! He just came to my school! Absolutely loved him! He did an amazing job at sharpening my shears! Definitely going back to him. Jeff was so professional and nice. I love that he came to us to sharpen our shears. Would highly recommend his service. OMG let me tell you how amazing Jeff is, my main shears were not working because of a botched sharping job that I had already tried to have someone else fix and that made it worse!! He was my last try at saving them before I was gonna just give up and throw them away. He looked at them and he worked his magic and he fixed them they cut like a knife through butter again thank you so much for fixing my shears!